Many of you here know me and we’ve been providing our standard package of editorially-given, natural, and outreach-based links to the community here for almost a year. For those that don’t, I’m a linkbuilder who cut my teeth with clients in the highly competitive Viagra, Pay Day loans, and Poker spaces before moving on to Drug Treatment; all white-label work on behalf of some of the biggest names and agencies in the business. Now I run a rapidly-growing outreach and link acquisition business that helps everyone from the smallest authority sites, making their start in the business, to established players ordering over 60 links a month. Our standard product has been hugely popular, but many of our customers have been coming to us for custom packages featuring higher authority links, or different types of content. Some clients have needed help with linkbait. We’ve combined those requests into our most premium offering ever. Natural links are the cornerstone of building an authority site, but they're hard to come by. You have to craft beautifully-written content, worthy of being linked to. Then begin the painstaking process of outreaching to potentially interested webmasters to secure those links. Reach Creator Premium handles the entire process for you. We generate ideas for premium linkbait content. WordAgents crafts it. All you have to do is post it and we'll secure high-authority links for you. By crafting a new linkbait for you, every single order of 10 links, we secure authority links spread evenly throughout your site and new content. This is a powerful tool for your interlinking strategy [check out my interlinking guide here] which you can use to drive authority to your sales pages, homepage, and important early-funnel blog posts. You don't even have to come up with the linkbait ideas, we handle it all with WordAgents. You just have to publish the post and add the free images WordAgents sources for you! Many of our competitors are selling DA10-20+ links (which we all know means a site that's existed for a bit and links to itself, and little more) for $199/link. For just $30 more you get a guaranteed DA26+ link and for every order of 10, a beautifully crafted WordAgents linkbait article. Our standard pricing available online (http://reachcreator.com/outreachlinks) is $2,350 for 10 links, including us coming up with a linkbait idea, @stackcash’s team at WordAgents writing it, and us handling all the outreach, content and linkbuilding. With the value of the long term price lock in (2 years if you keep ordering promptly after a cycle finishes) and the straight up $200 discount it's a great opportunity to join the first five and get a great deal on the best links and best linkbait we've ever offered. Not all sites/domains will be suitable for natural links and outreach (particularly aggressive monetisation or some niches). We will let you know if you don't qualify before we move forward. Natural links take time so delivery is typically 4-6 weeks. Once you're rolling with a monthly order we can deliver within a week of the renewal date consistently. No contracts, no commitments, all we ask is that you give us as much heads up - preferably at the start (not end) of your last order - as you can that you're not continuing. Am I eligible for this deal? PM'd you but posting here too. I'm interested. Glad we're off to a rocking start on your campaign! Messaged back and slot reserved. 4 slots left everyone with the discount and bonuses. I'm in. Sending PM now. Thanks everyone - there are still 2 packages left (provisionally)! I expect they'll all be gone soon. Steve mentioned that this is getting a lot of interest! Thanks so much to everyone who's jumping in. If you guys have any questions, comments, or concerns related to the content portion of this service - feel free to shoot me a PM. Four are provisionally gone so possibly just one left to order if everyone clears up invoices etc. Time to jump on if you want all the bonuses that are coming with these first ones. Thanks to everyone for your support launching this new service. Vin's linkbaits really are fantastic as is his team's writing for any guest articles that come in so you'll really love your reports. Hi Tom - that's great, I've just replied now, looking forward to working with you. That's one of the next 5 discounted orders provisionally claimed. I've also got one chap in the UK to talk with about one today so potentially 2 of the 5 are gone already. Any reviews of this from those who've ordered? What kind of linkbait are you guys matching up with these sites... like pennyhoarder social type, name dropping/ego-baiting, or stout 5-10k word how-to guides or something? I have been meaning to leave a review for Steve, while I didn't order this exact service, I did get the minimum DR40+ links order for my website. A little background - I run an informational website that is related to government services and it's been live for a few years. 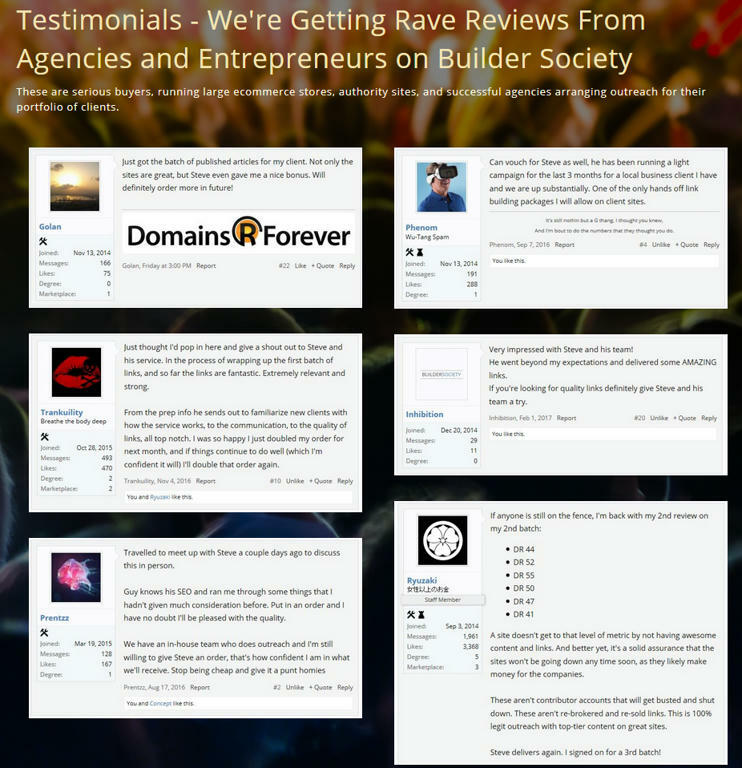 I have done some light link building for it and in the past year I have added a lot of long form content to it. Since it deals with government services, you can imagine there are a lot of GOV sites in the SERPs so competition is solid. I knew I needed to get serious if I wanted the site to grow more, so I discovered and enlisted the help of Steve to build some link authority to it and help boost some of the newer content I posted. In the interest of full transparency, there were a handful where I thought the quality was not on point, but the bonus and the overall quality more than made up for it. Also I made sure to relay my feedback to Steve before I made my second order. Steve took all my feedback and he again over-delivered with many links above DR 50 and this time all of them met my expectations. Non-profits, community service organizations, real business website blogs (one of them has been in business for more than 17 years) and even a sweet link from an official website of a European Parliament Leader! These are real sites from real organizations and businesses and not some mom and pop running an affiliate spam site disguised as a lifestyle blog with 50% sponsored posts. I have since reordered again and will be using Steve's services for my future campaigns. Thanks Steve and team! Hey @chanilla thanks for dropping by and sincere apologies for the belated reply. Of course I don't expect you to shoot an order over now but thought an apology at least is in order. For future visitors we haven't got many reviews on this thread yet as it's an 'amalgamation' of services but if you check out both my regular thread (for the links) and WordAgents regular thread for the content there are an absolute country mile of reviews for the services as they stand. What I will say is that if you order this service with WordAgents doing the linkbait you WILL be offered a big renewal bonus - at least an extra 10% and up to 30% links has been really common, because they do that much better when his team has handled the writing vs an average linkbait. It's worth the investment of having him knock one together on this package, based on a spec we come up with, if you're looking to go for a few months of linkbuilding. The linkbait themselves are typically about 2,000 words, research/data based and stuff that's easy to get links to. Replying just now, thanks for getting in touch. We're keeping it open till midnight on the 31st. Anyone who orders in 2017 on any of our packages (this one or the main thread) keeps their 2017 pricing all 2018 so jump on now if you're on the fence everyone! I recently had my first order delivered. Results were as described and overall really great quality links at niche relevant sites I don't think I would've thought to reach out to on my own. And, of course, the linkbait from Word Agents was quality stuff. I was unlucky in that my order was being fulfilled during the period when Ahrefs changed they way they calculate DR. Steve let me know right away and gave me options on how they could finish up the order. Overall, I think the service Steve's team offers is a great value if you need to free up some of your time by outsourcing your link building. I immediately placed a second order and expect to continue using Steve's service.